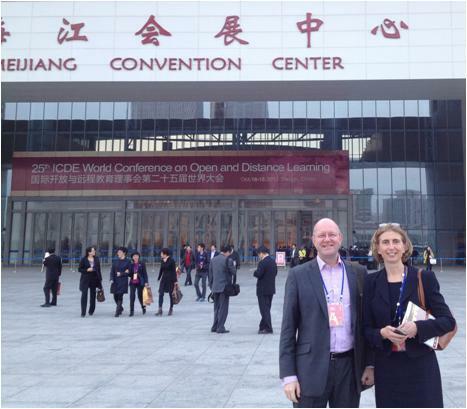 Simon Askey, Deputy Director and Patricia McKellar, Associate Director of the Undergraduate Laws Programme, attended the International Conference for Distance Education in Tianjin, China. The conference, which is held by the International Council for Distance Education, attracted 700 delegates from over 40 countries and there were in excess of 100 papers presented. The theme of the conference was New Strategies for Global, Open and Distance Learning and provided a broad platform for educators who are engaged and interested in open and distance learning (ODL). There were several global keynotes speakers who addressed the conference on areas such as quality in ODL, the emerging culture of ODL, MOOCs and the regulatory environment of ODL. Patricia was presenting a paper along with Olivier Chapman, Head of Institutions Assurance in the Corporate Performance and Quality Department at the University of London. Their paper, entitled Using QA to enhance the quality of teaching at remote teaching institutions, centred on the Teaching Institutions Recognition Framework and, by using the Undergraduate Laws Programme as a case study, they identified areas where the recognition process had contributed to enhancement of the student learning experience.